Q: Philippine President Duterte said on March 23 that he will invite China to send a battleship to visit the Philippines. What is your comment? A: Military-to-military exchanges and cooperation is an important component of China-Philippines relations. 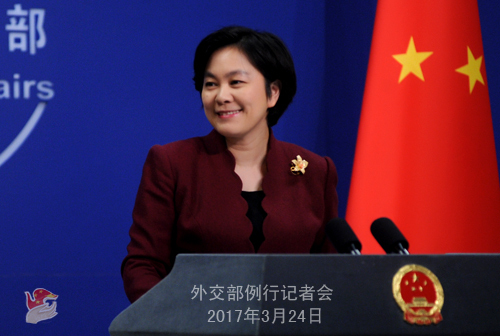 As the bilateral relationship improves, China would like to enhance exchanges and cooperation in relevant fields with the Philippines. As for Chinese military vessels visiting the Philippines, the two sides are in communication. Q: Some local Pakistani companies say that Chinese suppliers to the China-Pakistan Economic Corridor (CPEC) projects are getting generous terms on taxes, while local companies have not. They also fear that when special economic zones open, the same things will happen. How do you comment on their concerns? There are risks that once the CPEC trade routes officially open, Pakistan will be flooded with cheap Chinese products, which will make it hard for local Pakistani companies to survive. What is your response? A: I am not aware these details you mentioned. Also I don't think that the scenario you described will happen. The CPEC is a new cooperation framework set up by China and Pakistan to pursue long-term development. It is also an important project of the Belt and Road Initiative. It is important, not only in promoting common development for China and Pakistan, but also in promoting regional connectivity and common development and prosperity of regional countries. In advancing the CPEC, China and Pakistan adhere to the principle of extensive consultation, joint contribution and shared benefits. The dividends and benefits brought by the CPEC will be shared by people in China and Pakistan and in the region. Q: Yesterday, the Guards of Honor of the Chinese People's Liberation Army participated for the first time in the military parade marking Pakistan's Independence Day. Some foreign media believed that this showed how much importance China attaches to its relationship with Pakistan and the China-Pakistan Economic Corridor (CPEC). What is your comment? A: At the invitation of the Pakistani military, honor guards of the three services of the Chinese People's Liberation Army sent a formation to march in the military parade marking Pakistan's Independence Day. China and Pakistan are all-weather strategic cooperative partners, and the Chinese and the Pakistani military maintain traditional friendship. In 2015, Pakistan sent a formation to take part in China's military parade celebrating the 70th anniversary of the victory of the Chinese People's War of Resistance Against Japanese Aggression and the World Anti-Fascist War. Joining the Pakistani side in its military parade this time is another vivid testament to or an epitome of the high-level strategic mutual trust and friendly relations between the two countries and the two military. As for the CPEC, I just said that it is a new cooperation framework set up by China and Pakistan to pursue long-term development. It is also an important project of the Belt and Road Initiative. It is important, not only in promoting common development for China and Pakistan, but also in promoting regional connectivity and common development and prosperity of regional countries. 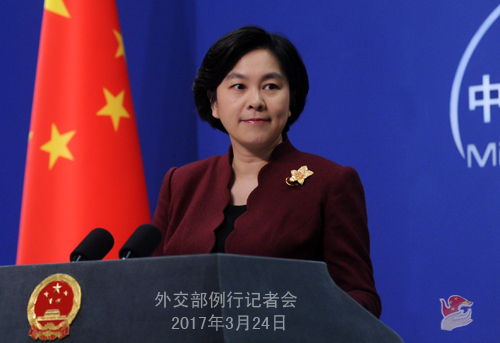 China stands ready to work with Pakistan to move forward the CPEC so as to benefit the two peoples at an early date. Q: Hong Kong will hold the election for its Chief Executive on March 26. What is your comment on the significance of this election? What is your expectation for it? A: I would refer you to the Hong Kong and Macao Affairs Office of the State Council. Q: The Ministry of Education of Japan released its newly authorized textbooks today. 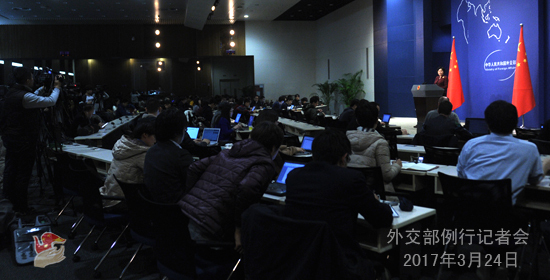 There will be no definite number of the Nanjing Massacre death tolls in the authorized books to be used next year. What is your comment? A: I don't know how long you've been working in China and whether you've visited the Memorial Hall for the Victims in the Nanjing Massacre. If you did visit the Memorial Hall, how would you feel when you saw this news. The Nanjing Massacre has long been established by the international community as a heinous crime committed by the Japanese militarists during their aggression into China. There has been a certain conclusion on the number of casualties from early on. With iron-clad evidence, it is extremely wrong and highly irresponsible for the Japanese government to deliberately gloss over, deny, or even falsify that part of history. This will not help Japan pass on to its future generations a right approach to history and a right understanding of its past relations with neighbors. And this will make it very difficult to guide the young in steering the future relations between Japan and its neighbors in a right way. We urge the Japanese government to assume a responsible attitude towards its people, history and its neighbors. It should inculcate a right attitude towards history into its people, instead of misleading its next generations with a wrong one.